Q: What biological problems should I be concerned about? A: Molds, mildew, fungi, bacteria and dust mites are some of the main biological pollutants inside the house. Some, such as pollen, are generated outside the home. Mold and mildew are generated in the home and release spores into the air. Mold, mildew, fungi and bacteria are often found in areas of the home that have high humidity levels, such as bathrooms, kitchens, laundry rooms or basements. Dust mites and animal dander are problematic when they become airborne during vacuuming, making beds, or when textiles are disturbed. A: Allergic reactions are the most common health problems associated with biological pollutants. Symptoms often include watery eyes, runny nose and sneezing, nasal congestion, itching, coughing, wheezing and difficulty breathing, headache, dizziness and fatigue. Dust mites have been identified as the single most important trigger for asthma attacks. Q: How are biological contaminants transported through the house? A: Molds and dustmites thrive in areas of high humidity. Mold grows on organic materials such as paper, textiles, grease, dirt and soap scum. Mold spores float throughout the house, forming new colonies where they land. Dust mites thrive on dead human skin cells and in textiles such as bedding, carpeting and upholstery. When these textiles are disturbed during vacuuming, making beds or walking on carpet, the dust particles become airborne. Pollen, plant material that enters through the windows or on pets, and animal dander also become airborne when disturbed. Infectious diseases caused by bacteria and viruses are generally passed from person to person through physical contact, but some circulate through indoor ventilation systems. Q: If I'm concerned about the biological contaminants in my home, what can I do to deal with the problem? A: There are no practical tests for biological contaminants for use by non-professionals. However there are signs to watch for. You can sometimes see and smell mold colonies growing on surfaces. 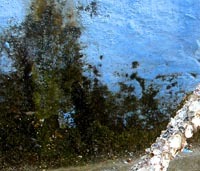 Mold growth should be suspected wherever there are water stains, standing water or moist surfaces. Prevent mold growth by keeping basements, bathrooms, and other rooms clean and dry. Use a disinfectant to clean surfaces that have mold on them. If carpeting or furnishings become wet, they must be quickly and thoroughly dried or discarded. Humidifiers, dehumidifiers and air conditioning condensing units should be removed and cleaned. Vacuums with high efficiency filters or central vacuum systems can help reduce the airborne dust generated by vacuuming.